Debt Perception | In too deep. My journey out of debt. My debt has decreased by an overall reduction of $16,588 in 30 months. 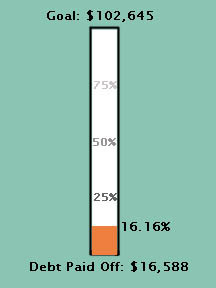 I’m now at 16.16% of my debt payoff goal. My debt has decreased by an overall reduction of $16,423 in 29 months. I’m now at 15.99% of my debt payoff goal. Been a while. Been a crazy year so far. I’ve had a lot of health issues. Constant health issues. I’m working on addressing those issues and getting healthy again, getting back on track with my debt pay off. This year will definitely be a memorable one. Lots of changes happening. I also turn 30 in June and celebrate 20 years of being cancer free! Can’t wait to celebrate! My debt has decreased by an overall reduction of $16,011 in 27 months. I’m now at 15.6% of my debt payoff goal. I’ve been slacking so far this year. My mom came to visit for a month and I had a wonderful time. After she left, I hit a major depression. I haven’t worked much, haven’t been volunteering, and don’t have motivation to do much these days, especially after recently suffering from sudden hearing loss. I’m now on two weeks of high-dose prednisone and am not a fan of the side effects at all. I don’t know what I’m doing and I’m not myself these days. Bear with me as I get back on track. I’m still alive. I’m just kind of lost in life. I apologize for my blog being down. I didn’t check my email for almost 2 months, oops! 25 Month Progress Update and a Close Call! I had forgotten I made out a check to pay a medical bill (I typically pay these with a card online, but it wasn’t an option) in the amount of $47.89, exactly, leaving me with a $0 balance. Yikes! My debt has decreased by $1,787 since last month. An overall reduction of $15,465 in 25 months. I’m now at 15.1% of my debt payoff goal. I made quite a bit of extra money from pet sitting during the holidays and was able to completely pay off StudentLoan#1 well ahead of schedule! Two private loans down, two to go! I paid off my credit card and one of my student loans. I made a $7,722 decrease in student loan debt for 2014. I over made $1,100 in side income (selling stuff, baby/pet sitting, house cleaning, and survey sites). I bought a domain for my blog. I visited my family in Wisconsin and Upper Michigan twice. Through 23andme DNA testing, I found out I am over 27% Finnish. I took a staycation and experienced a number of firsts (mani/pedi, hibachi, sushi, cards against humanity). Participated in a Relay For Life with my best friend. I was running regularly (couch to 5k) normally for a month. USPS messed up 3 times. I learned what OPP stands for (you don’t want to know). I stopped running when it got cold. My sleep debt took a bigger toll on me than my actual debt. Stress was through the roof! I had lots of health issues: stomach pains (IBS), hiatal hernia, food poisoning, colds, many sinus infections, 3 infections at one time, nasal polyp, sinus deviation, sinus surgery, at least two corneal abrasions and two instances of having to wear an eye patch, eyelash/skin removal procedure, D&C surgical procedure, and I developed allergies. Remember my 2014 Goals…Overkill post? Below is what I actually accomplished from that massive list (100% passed, no almosts). Play with my cats prior to meal time – It has seriously helped them not run around like crazy on top of me very early in the morning. Add about $25 to our savings account after each pay day to grow our emergency fund to $1000 by the end of 2014. Create a daily skin care regimen. Get rid of/sell things we no longer use. Acquire a kitchen table and microwave stand/cart. Make $200 a month from side hustles (pet/baby sitting, house cleaning, surveys, Fiverr, etc). Pay off StudentLoan#1 before I turn 30 in June. Apply for co-signer release on my private student loans. Get hubby on board with budgeting. Look into some kind of retirement savings (because relying on death or the future NFL success of my best friend’s two year old child aren’t smart options). Weigh the pros/cons of pet insurance. Relearn the programs that are relevant to my Media Arts & Animation degree. Create a minimum of four pieces of art to add to my portfolio. Have a portfolio website up and running by October 2014. Have several blog posts written in advance, schedule them, and stop neglecting my blog! Have guest posts on my blog and write guest posts. Look into affiliate programs and ways to make money through blogging. Complete a 30 Day Drawing Challenge. Practice face painting and caricatures (would make great side hustle income). Get my air brush working! Sew at least once a month – I have so many pairs of pants that need hemming and would love to be able to create and alter clothes that fit me. Every night complete the Kiss Your Dentist Goodbye dental care regimen. Keep a sleep diary and figure out how to get some quality Zzzz’s! Begin strength training with the end goal of kipping before my 30th. Take a daily walk, eventually add running spurts and run a damn mile! Log my food/calorie intake on MyFitnessPal. Cut back on processed food, eat less sugar. Prepare meals/snacks ahead of time and don’t waste fresh produce! Schedule and manage my time better (cleaning, cooking, exercising, reading, relaxing, wake up and bed time routines). Spend less time watching tv shows (except the ones I really enjoy). Visit my best friend in South Korea! Learn a little sign language. Sort through Hubby’s boxes/piles of stuff and clean up the guest bedroom. Hang decorations that I have and create new ones. Attend a marriage retreat to work on improving our relationship. Make more friends and do things I enjoy (bowling, dancing, game nights, arts & crafts, etc.). Yep, once again, I have a massive list. There’s a lot of things I want to change and I know that I will likely fail at most of these in 2015, but I have to try! Happy New Year!